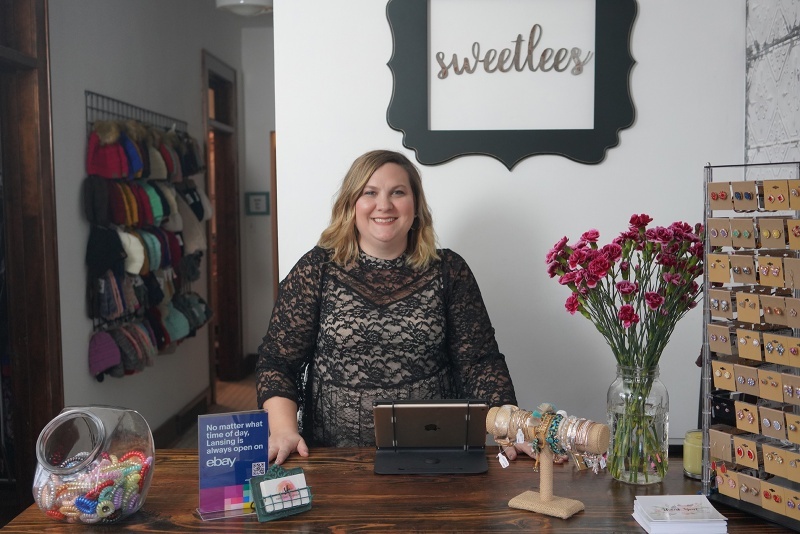 Cori Thackary - Meet Our Sellers: Partner to Sellers - eBay Inc.
With just $700 earned from a craft fair, new-mom Cori Thackary formed an LLC and invested in a couple of sweaters she sold to her friends. That investment turned into a thriving brick-and-mortar and eBay business with a mission to make every body feel beautiful. Q. Who is your buyer, and what are they looking for? A. I would like to say that who I target is someone who's in her 30's, she may have a couple young children.. But we also have women that are in highschool who shop with us and we even have some customers in their 70s. So, I try to find pieces for my store that are functional. So women can wear them to work or to class, these pieces allow women to move around in easily, they can move, and be active. These are all items that you can wear throughout the day, and then out to drinks with your girlfriends. I think when a customer comes in, and they're looking for something that's flattering to their body and we give them a piece for them to try on and they come out of the dressing room; their shoulders are back, and they have a big smile on their face. You can just see the happiness glowing from their skin. That's our mission. We want our customers to feel good. It's not always how you look on the outside, but as long as you have that confidence to go about your day, that's what we try to provide. Q. How do you connect with your customer? A. We listen to our customers' feedback. We think that every comment that they give us is something valuable that we can learn from. This community has been so supportive of my business, and really thankful and grateful for what we have to offer. Q. How do you think your product makes your customers feel? A. I think our products give the customers confidence. We've had many women come in saying that they feel frumpy. Maybe they recently had a child, they've gained weight over the last few years. They haven't felt pretty in a long time. Maybe they feel embarrassed to shop in a store, because of their size. So many of those women come in here and thank me for providing them with cute, comfortable clothing that they can feel good about themselves in. Q. How do you decide what inventory to stock? A. When I go to markets or I vend to the Los Angeles, to the fashion district to purchase my items, I hold up a piece and I think "Is this something that I would wear? Where would I wear this? Is it comfortable? Does it have stretch to it? Can I wash it? Is it easy to launder? Can I play with my kids in it?" Those are the things that go into my thought process when I purchase every item in the store. A. I've always wanted to have my own business. When I was a teacher, I would make crafts and sell those to my teacher friends. At one point I even joined a craft show. (I thought I wanted to sell handmade items, which turns out I didn't.) I made about $700, took that money and I reinvested it. I formed an LLC, and I bought two styles of sweaters that I thought would be flattering for women like myself. I sold those pieces to my friends, and I reinvested every penny back into the business. Now we're in a 1400 square foot, beautiful building on the town square. We're bursting at the seams. Q. Can you tell us a little bit about your mission? A. We believe that our fashion here is for everybody, so no matter what size your body is, what shape you are. We believe that we have some kind of pieces in our store that will be flattering for you no matter what size or shape you are. Being pretty is so much more that what you look like on the outside, it's how you feel on the inside and if that gives you confidence throughout your day. It's important to me that my customers feel beautiful. Q. What is your favorite thing/ most exciting about selling on eBay? A. The most exciting thing about selling on eBay, is seeing where the customers are coming from. We've sold a few things to people in California, and just knowing that my little, small shop in Michigan is making an impact across the country.